Most muffins are – despite being called “healthy” – nothing more than cake. The refined flour, sugar, and bad fats in muffins are murder for your waistline. Maybe that’s why they call the fat that spills over the top of tight pants a muffin top? The recipe below uses coconut flour instead of a grain-based flour. It’s lower in carbs, lectins, and gluten, so it’s much better for your body. So if you are having muffin cravings, give these muffins a go They make a yummy addition to your breakfast and kids love them for a snack. In a medium bowl combine the eggs, melted (and cooled) coconut oil, vanilla and almond extract, maple syrup, lemon juice and zest. In a small bowl, whisk the coconut flour to remove lumps, add salt and baking soda. Mix the dry ingredients into the wet ones, then gently fold in the blueberries. 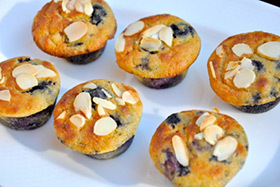 Fill each mini muffin tin to the top, then sprinkle with sliced almonds. Bake for 30 minutes, then turn on the broiler for 1-2 minutes to lightly brown the tops. Keep a close eye on the muffins while you brown them, they can go from browned to blackened quickly. Allow to cool before removing from muffin tin. Store in an airtight container in the fridge for up to a week.